The AMX 12 t is a French tier 6 light tank. This design of a light high-speed tank was developed in 1946. The vehicle was never actually produced, but became the basis for the well-known AMX 13. 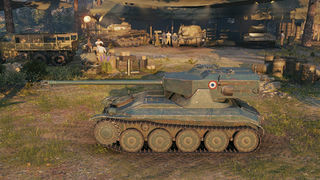 This tank is the first automatic loader French light tank. The automatic loader is connected to two (only one of these is used in WoT for game balance) 6-shell drums in the back of the turret which are loaded with shells from the storage compartment in the rear of the tank's hull. Due to game balance, this has been further reduced to 4 shells in a drum, fully loaded. This allows the autoloader to rapidly unload the main gun four times in a row (on average 540 damage). The tank may then head for cover, whilst the drum refills. Since there is no need to manually reload the main gun during the actual combat, there is no need for a designated loader. 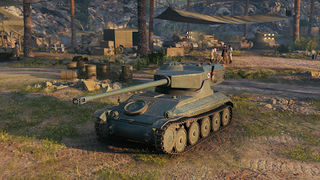 The AMX 12 t leads to the AMX 13 F3 AM, and the AMX 13 75. Compact size and excellent concealment values. With maximum concealment, it can remain undetected even at close ranges. Excellent signal range (750 upgraded). Best pen for a tier 6 light tank, good accuracy and fast shell velocity. Terrible accuracy on the move, abysmal dispersion when moving the turret, long aim time. Very low ammo count, only carrying 36 ammunition with the top gun. Delicate modules; A hit to almost any part of the tank can cause significant module damage, including engine and ammo rack. Very poor gun elevation and mediocre depression; This can prevent you from shooting at targets on overly uneven terrain. This tank introduces the concept of using an automatic loader to rapidly feed the gun with shells from a magazine, which in this case are two 6-round drums in the back of the turret. Due to an older update affecting light tanks, this tank was changed to having a 4-round drum instead. The drum enables the tank to fire four shots rapidly, with the unfortunate side effect of taking a considerably long time to reload the whole drum. This would not be a problem if the game allowed firing shells from a partially reloaded drum, but it does not. The general tactic for this tank while in combat is to circle or flank an opponent, firing shells into their sides and rear, followed by a hasty retreat while you reload. This tank only holds 36 rounds of ammunition with the stock and upgraded cannon. It works best as a scout and flanker, quickly zipping in and out getting spotting, and circling weaker/slower/lightly armored enemies putting shots in them, then retreating to safety and repeating. Be sure that you don't take on opponents by yourself that you cannot take out in a single clip, or quickly make a getaway from. The AMX has paper-thin armor and won't bounce shots outside of the occasional gun or track absorption, and a single shot can easily take our your tracks or engine leaving you vulnerable. If you're fortunate enough to be in a top tier match, use your concealment values to your advantage. 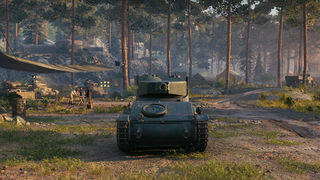 You can easily out-spot all lower tier tanks, and safely hide within bushes, taking shots at passing tanks rather safely, making this a perfect assassin when on top. It also rather easily out-speeds other tanks, allowing for rapid maneuvers for dodging shots or getting out of dangerous situations. With the exception of a few heavy tanks, it can also clip all tier 5 and under tanks with relative ease. If you find yourself in a bottom tier match, your best bet is to either find a safe bush to spot from, or make quick passes over ridges and around houses to spot opponents, and then fall back once spotted until you're unspotted again, before making another run. If you have to engage with an opponent, try to rely on your speed to avoid shots and circle opponents with slow turret traverse speeds, hugging up to them in some cases to lessen the appeal to artillery attempting to aim at you. In summary, the AMX 12t is a fun little light tank to play, often taking on a more offensive stance than most other light tanks. Use it's advantages in it's excellent concealment values, rear-mounted turret, autoloader, good penetration, and speed, and help to compensate for others such as the lack of accuracy on the move or lower view range through equipment and skills. Unfortunately, no modules carry over from the AMX ELC Bis. Fourth and finally, research the radio. AMX 12t is the older brother of the legendary AMX-13. The design weight of the tank was 12 tons. The AMX-13 chassis was designed as an example of this very light tank. The rear support roller was an idler wheel. However, this design caused problems with the tension of the tank tracks and, in general, there was less reliable. 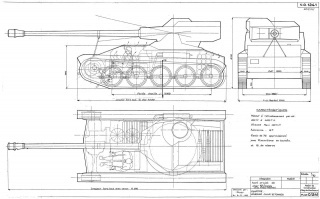 Subsequently, it was been taken into account when designing the AMX-13: A separate chassis was jacked up and the idler was extended, causing the hull to be lengthened. This page was last modified on 13 June 2018, at 01:01. This page has been accessed 479,265 times.